If yesterday (Day 13) was about the sorts of things that make this trip occasionally challenging, then today was like winning the PAC Tour lottery. The lights came back on at 11:30 last night, so I got up and posted what I’d written and uploaded my pictures. I then went back to sleep. I think I probably slept close to nine hours last night, which is about two more than I’ve been averaging on this trip. As a result, I felt a lot better when I got up today, and felt pretty good throughout the day, although the cycling conditions might have had something to do with that. When I looked outside at first light, the sky still seemed pretty threatening, but by the time we walked across the road for breakfast it was starting to clear somewhat, although it was still chilly. Lon, Anurang, and I left the motel with the intention of checking out downtown Las Vegas, which is about as unlike the other Las Vegas as it could possibly be. The town bills itself as the best-preserved example of western boomtown architecture in the west, and I believe them. The center of town is full of the lovely Italianate buildings such as a well-to-do person would have wanted circa 1900 to 1910. Many buildings were constructed of native stone (and there’s some nice stone around here) and then faced with bricks brought in on the railroad. Once we got rolling, it was clear that the forecast north wind was blowing steadily, and what seemed like arduous hills on the way into town melted beneath our wheels. I believe we were the last riders to leave Las Vegas, thanks to our sightseeing detour, but we almost caught up to Joe and Phil before the first rest stop at about 27 miles. Very light Saturday morning traffic on Highway 84 and beautiful New Mexico scenery also made the miles go more pleasantly. At one point, I made them stop and look behind us: the mountains we came over yesterday were covered in snow. Lon said he heard that it snowed in Glorieta Pass yesterday, in fact. Well, New Mexico needed the rain, so I’m glad we were able to do our part to end the drought. We continued on Highway 84 through the town of Dilia, which is where five years ago Lon, myself, Don Norvelle, and Gary Bass tried to find the great lost shortcut to Colonias. Although Lon had a note about this possible old alignment on the route card, I don’t think he expected anyone to try taking it, since he hadn’t had a chance to scout it out properly since 2001 and still wasn’t sure where the road actually was. You can probably get most of the story from my 2001 Route 66 website, but the short version is that that we got lost when we took a dirt road from around Delia and finally got directions from some ranchers who were out looking for a lost puppy (which Lon found for them). One of the ranchers gave Lon his card and said he could help him figure out the route, but Lon misplaced the card a couple of times and was never able to get back in touch with the guy. So, we were keeping an eye out for a road that might be the correct one branching off to the left toward Colonia. The alternative was to continue straight south on 84, make a left turn when we hit I-40, and then take that east to Santa Rosa. Lon’s theory was that the Delia-Colonia road would eliminate this right-angle route and shorten the distance like the hypotenuse of a triangle. Lon suspected that County Road #40 might be a candidate, although it was quite a few miles past Delia. I noticed what I thought was the dirt road we took five years ago, and I kept an eye out for other possibilities, but I didn’t see anything very promising until Lon pointed out what turned out to be #40 switchbacking over a distant low hill to our left. When we got to the road, we stopped to wait for Anurang and decided that we might as well see where it seemed to go. We were still a few miles shy of the second rest stop, so we also flagged down Joe and Phil before they passed us, and told them to let Rosemary know not to wait for us. County Road #40 headed due east from Highway 84 for about a mile before reaching some ranch buildings at the base of the hill, and the first few hundred yards were actually paved. A sign said that it was called Moon Ranch Road. When we got to the ranch, a pickup truck pulled out, so we stopped to talk and see if we could find out where we were going. The rancher was tall, lean, and dark, with a black moustache and a cowboy hat. I got the feeling he was a bit suspicious of us at first, but as Lon explained what we were doing, his attitude softened a bit to where I think he just thought we were harmless eccentrics. Yes, he said, the road did go through to Colonia; you just kept going until you hit pavement at a t-intersection. If you turned left, you’d go to Colonia, and if you turned right, you’d go to the interstate, near Stuckey’s. This sounded promising, so we continued on. Anurang and I could see that Lon was excited about possibly filling in this part of the Route 66 puzzle, but it was a lovely ride in and of itself. We went for over an hour without seeing a single vehicle, although we did scare a few cows. The road was well maintained, but it was basically hard-packed dirt and good-sized gravel. It wound up and down, following the contours of the land, until we finally did reach the promised asphalt road. Sure enough, a left turn would take you down to Colonia, and the paved road was called the Colonia Road. We probably should have taken the left turn to see what would happen, but instead we decided to go right and see how far it was to the interstate. I was pretty convinced that the road we were on used to be Route 66 before 1937, but neither Lon nor I was sure how it related to the road we had been on five years previously. This paved road was really nice with, again, almost no traffic. At one point Lon wondered whether maybe this was the road we had reached Stuckey’s on five years ago, since it reminded him a lot of where he found the puppy, but it was pretty clear that the asphalt had been there longer than that. Eventually, we topped a rise and saw the telltale semis in the distance. A little closer, and we could see Stuckey’s, which was off to our left. We pulled in there to get some snacks and drinks, since we had been almost 50 miles without any support. Inside Stuckey’s, I asked the lady at the cash register if the road to Colonia went anywhere after Colonia. Oh yes, she said, to Moon Ranch. I said we’d come on the Moon Ranch Road but wondered if the old road had used to go straight, perhaps to Delia? She wasn’t sure, but she asked another woman who worked there, and she said that the road used to go straight but that now it was private property. 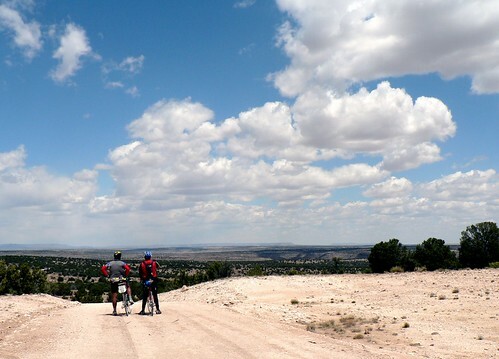 So, we got on I-40 and rode, quickly, downhill and with the wind at our backs, to Santa Rosa. One complication: the interstate was being resurfaced, so there was no clear indication where the shoulder was for most of the way to town. This was a bit disconcerting, but we managed to get in all right. Anurang and I grabbed a grilled cheese sandwich at the motel’s restaurant (the worst fries on Route 66 said Anurang) before he, Lon, and Franz took the van back to Colonia to see if any sign of a road still existed north from there.